Last week as I was getting my nails done, I looked in the mirror right beside my head and saw lots of grey, way more than I remember having. Needless to say the thought of being that grey is not appealing to me. Ohh, pretty, yellow, right? Hell no, that is step one in the dyeing process. I may be getting older but I refuse to grow up. The dye goes in. Beyond the Zone Color Jamz Candy Apple Red. Yeah, it doesn’t look very candy apple to me, either but, still, pink will work, right? Step number 3, wrap your head in plastic and wait several hours while the dye soaks in and the heat from your head helps to set it. Since this is a veggie dye you can leave it on for hours and hours. The next step you can’t see, as no one wants to see me in the shower rinsing and rinsing and rinsing. The final result. PINK and yes, capital PINK. While the bottle lied about the true color, I still like the final color. And, no there is no adjustment to the color. All I did was block out the background. Wild, isn’t it? Posted in grey go away., hair, pink hair, wild hair | Comments Off on Grey? HELL NO! Today Tre turned 5 years old. He asked for a Star Wars party and boy did he get one. So, instead of a lot of words, a few words, a bunch of pictures. I’ll open the cards first, because I have to. Mikayla, Tre and Charlie. Note all the Light “swords”. I found them at Dollar General for 2 dollars each so all the kids got one. They light up purple and make noise. Tre showing the American Sign Language “I Love You” sign to me. Tony and I use that when it is better to be silent, Tre caught on and tells us he loves us like that all the time. Charlie, the cutest 3 year old little brother out there. In the middle of light sabering, which is why he has a silly look on his face. Tre’s big present from me and Tony. A clone trooper helmet. And Saturday we go see the new Star Wars movie. Living in the BIIIIIIIIIIIGGGGGGG TIIIIIIMMMMMMEEEE. Posted in Uncategorized | Comments Off on Happy Birthday Bear Bear. This is the Rainbow Bridge that leads from Niagara Falls, NY to Niagara Falls, Canada, in the middle of the bridge there are USA and Canadian flags marking the change over of countries. Now, if you note something, we are on level with this bridge. And, see how far down it is to the gorge? Yeah, I was shitting myself, as I stated in my first post about our Niagara Falls trip. I hate heights. But, the boat ride, honestly, riding on the Maid of the Mist boat at the foot of the American, Bridal Veil and Horseshoe falls is beyond description. The incredible power of the Niagara River crushing over cliff, and onto the rocks below, the enormous winds that take your breath away, and just the sheer beauty of being so close to it all is worth all the panic I went through. The real reason we were in the Falls though was family. As much as the Pietras clan as we could muster spent the day together, no formal pictures were taken but, there are some shots of various parts of the family. Ricky, Isabella, Sherry, Mary, Aunt Rosie, Katie, Tony, Shawn. 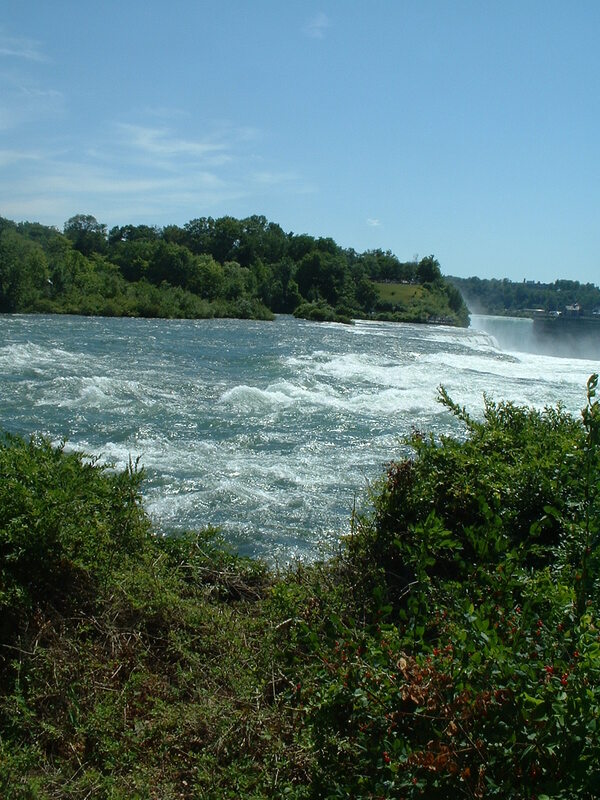 Those of you who have been reading for some time know that I was born in Niagara Falls, NY. In fact, I lived there until a few weeks before I turned 8 years old. Most of my family on my Dad’s side is still in, or close to, the Falls. Until Tony and I got married once a year or every other year, I went back to visit. Unfortunately from the year we got married until this summer we never were able to afford to go visit. This year, while we still couldn’t really afford it, we spent the money anyway. Not only did we get to see my family, we also did some touristy things as well. You know the kind of touristy stuff that people that are from an area never do? Like now, we live just an hour from DC yet, we never do any of the things that tourists do. Well, in Niagara Falls, that would be visiting in the Falls, taking the Maid of the Mist boat ride, things like that. Looking down on the Maid of the Mist boat tour on the Canadian side, we took the boat from the American side, so we didn’t have to fight the traffic over the Rainbow Bridge. A video of the falls and rapids that Tony took. While, I loved the boat ride while we were on it, the heights you have to go through, I didn’t so much. Being more than five feet of the ground (I am 5 foot 3 inches tall) is way too much for me. I tend to stay away from any type of height, but, to get to the boat, you had to be several hundred feet in the air over the river, the entire time we were going across the panic in my brain was insane. As soon as we got down to the bottom of the gorge, in line for the boat ane putting on our blue plastic ponchos I was in much better shape.